You already have a costume picked out for Halloween, so you might as well enter our costume contest! But, hey, if cosplay isn't your thing, then carve a pumpkin for a chance to win some comics. Or do both! 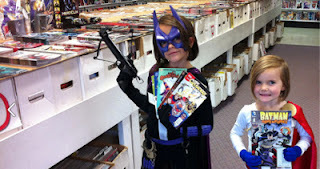 Submit a photo of yourself in costume while you hold up a recent comic book. We'll post all the pictures on our website on November 1 and let the voting begin! Here are the complete rules. Ooh, how exciting! This is our 3rd pumpkin carving contest. Do you have your pumpkin and design picked out? Carve your pumpkin. Take a picture of yourself with your pumpkin and send it to us at empirescv@gmail.com. We'll post all the pictures and let the voting begin!